Good fortune is the key to an amazing opportunity that has blessed Horsham this summer. The University of Chichester’s Otter Gallery had the good fortune to have a major refurbishment. It also had the good fortune to have a fantastic collection of contemporary British art. While it is being refurbished 17 pictures from its collection are being loaned to Horsham Museum & Art Gallery. This is an incredibly rare opportunity, literally once in a lifetime, as galleries don’t often lend out the crème of their collection, yet thanks to an investment by the University in its facilities, that is exactly what University of Chichester’s Otter Gallery is doing. The exhibition, which runs for two months from 17th July to 15th September, was only possible through the support of Toovey’s, the Washington-based auction house that assisted with the insurance of this major collection of art. For two months the art will adorn the walls of Horsham Museum’s recently opened art gallery, a venture which has attracted a whole new audience to the Museum. An audience that would go to the Tate to see a David Mitchie, or Elizabeth Blackadder, or Richard Eurich, or a Walter Sickert can now come to Horsham to see these works for the summer of 2012 only. 2012 is a remarkable summer for Britain with sporting and cultural highlights. For the town of Horsham it is also a remarkable summer that started with Matisse and now with this outstanding exhibition on display, an event only made possible through the work of Horsham District Arts, Toovey’s and The University of Chichester’s Otter Gallery. It is an exhibition that will go down in the annals of the town’s cultural history. ‘A Summer of Great British Art’ opens at Horsham Museum on 17th July and closes 15th September 2012. On July 21st Toovey’s Auctioneers and Valuers host their annual Contemporary Art Auction at their Spring Gardens salerooms in Washington, West Sussex. The auction is an eagerly awaited event for many collectors and connoisseurs of contemporary art and follows the preview exhibition “Off the Wall” at Horsham Museum and Art Gallery. While most art auctions deal with the resale of second-hand works, this auction is unique, as it offers new works entered by the artists themselves. This year, event organiser Nicholas Toovey has selected 150 works to showcase fifty of the best emerging and established contemporary artists around, the majority from Sussex. He describes the collection as “a diverse and eclectic mix of styles and media that really highlights what is being produced today.” The variety on offer is testament to each artist’s individual approach to his or her subject and medium. The sale offers paintings, prints, sculptures, photographs and ceramics, with a third of this year’s roster of artists newly sourced and appearing at the auction for the first time. One of the artists new to the event is Elizabeth Jardine from Brighton. 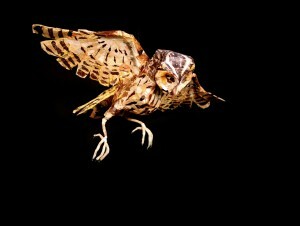 She has steadily been developing her work since graduating from Falmouth College of Art in 2003. Inspired by long walks in the countryside, her paintings are quiet and meditative, often views through wooded paths with flickering light dancing across the canvas. Alongside her 2-D work, and equally important to the artist, are her papier-mâché sculptures, three of which have been selected for the auction. 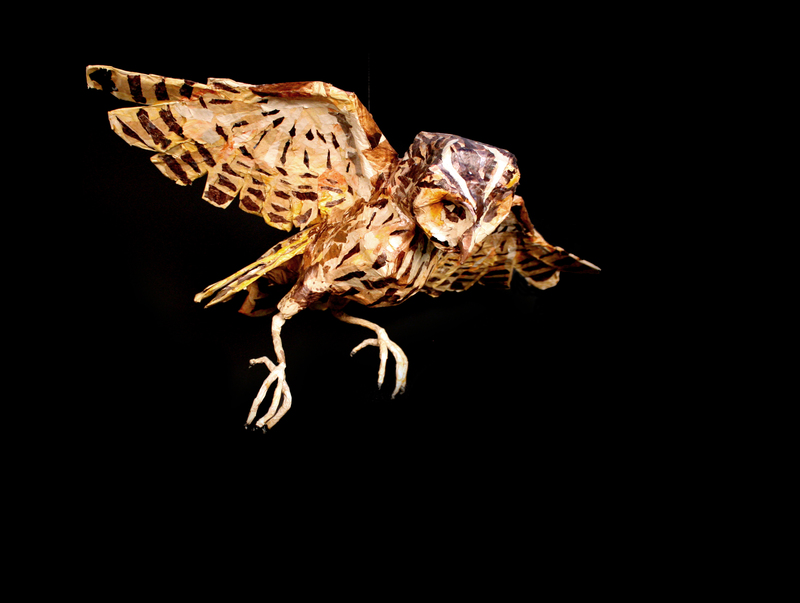 ‘Owl’ is a typical example of her 3-D work, where the wonkiness of cardboard and the energy of torn paper transform into characterful birds and animals full of life and spirit. Nicholas looks all year round for artists with the right dynamic to keep the auction fresh and different from previous sales. He carefully balances new participants with past contributors that patrons of the event have grown to know and love, such as Chris Kettle, Carolyn Genders, Paul Cox and Eve Shepherd. Richard Davidson has been a regular contributor to the auction over the years. 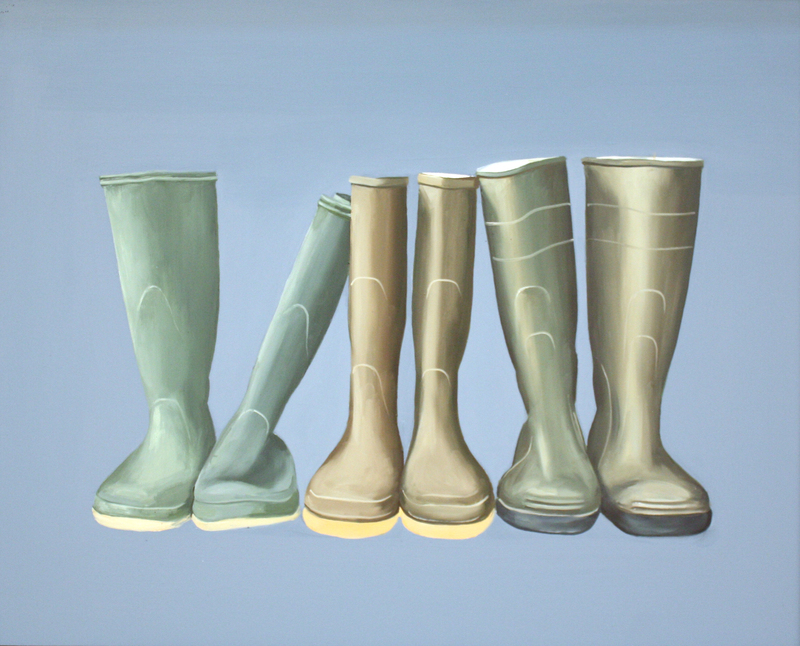 This year he has entered three original oils on canvas based on the extraordinary ordinariness of everyday things. Prior to training as an artist, Richard had a legal career in London. 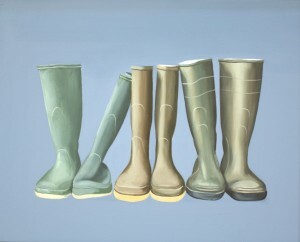 This obviously still influences his subject matter, as much of it relates to the accoutrements of white collar work in the city, but as he quips: “the precision and attention to detail required as a solicitor made it unlikely that I would ever be an abstract painter.” A typical example of his work entered in the auction is ‘Wellington Boots’, which shows his attention to detail and his typical solid colour background, creating the strong contrasts characteristic of his oeuvre. It does not show the link to working in the city in the same way as his other two works but perhaps, after living in Graffham for the last eleven years, life in the country is slowly altering his source of inspiration. 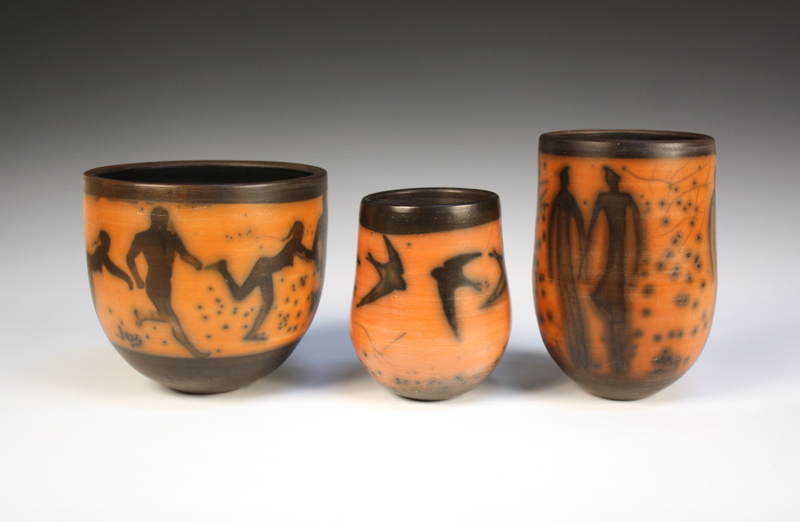 John Evans is among the fourteen ceramicists participating in the sale. The Worthing-based potter is a member of the Sussex Guild, the Craft Potters Association, London Potters and the Southern Ceramics Group. His work is largely in ‘naked raku’, an involved and lengthy process, which culminates in using the effects of smoke to decorate fired clay forms. 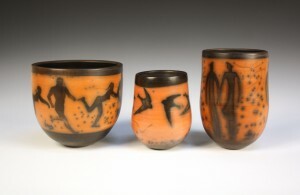 While raku can be produced in a variety of colours, the orangey background on the three pieces John has entered is a result of using a local clay as the slip. In fact for these works the clay was literally dug up from his own garden in Worthing. John burnishes all his pieces before the initial firing, which leaves them incredibly tactile with an unrivalled smoothness. 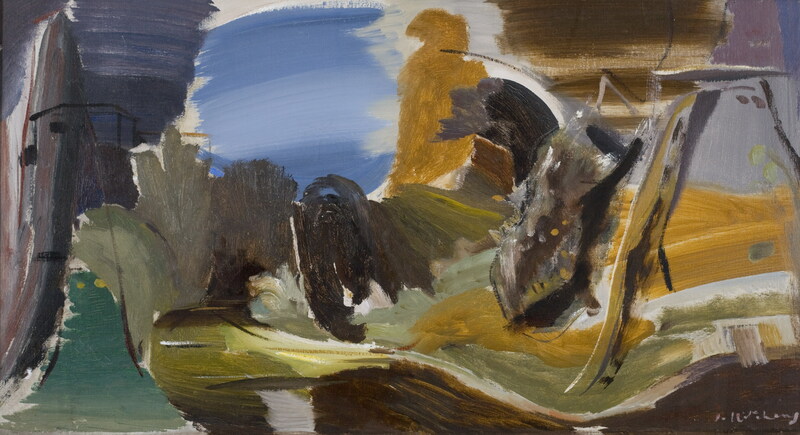 The auction has been described as “the best Contemporary Art Auction to be held in the South East.” This is largely attributable to the family-firm ethos of Toovey’s, combined with internationally recognised expertise and Nicholas Toovey’s personal passion for promoting the arts in Sussex. With works estimated from £50 to £8000, Toovey’s Contemporary Art Auction 2012 aims to be accessible to all, offering a friendly and enjoyable way to get involved in the contemporary art market. A fully-illustrated catalogue featuring interviews with each participating artist is currently available. The majority of works are on display at Horsham Museum and Art Gallery in their preview exhibition “Off The Wall” until July 7th. All works can then be viewed at Toovey’s Spring Gardens salerooms on Friday July 20th between 12 noon and 5pm and on Saturday July 21st from 3pm until the start of the auction at 6pm. Nicholas Toovey’s article was originally published in Sussex Life magazine in July 2012. 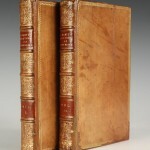 Toovey’s July Antiquarian & Collectors’ Book Auction catalogue is now online. The specialist auction includes a fascinating collection of books relating to the Polar regions. The list of authors include Robert Falcon Scott, Douglas Mawson, Fridtjof Nansen, Robert Peary, Roald Amundsen, Edward Evans, Apsley Cherry-Garrard and Ernest Shackleton to name but a few. The collection almost forming a who’s who of Antarctic and Arctic exploration. 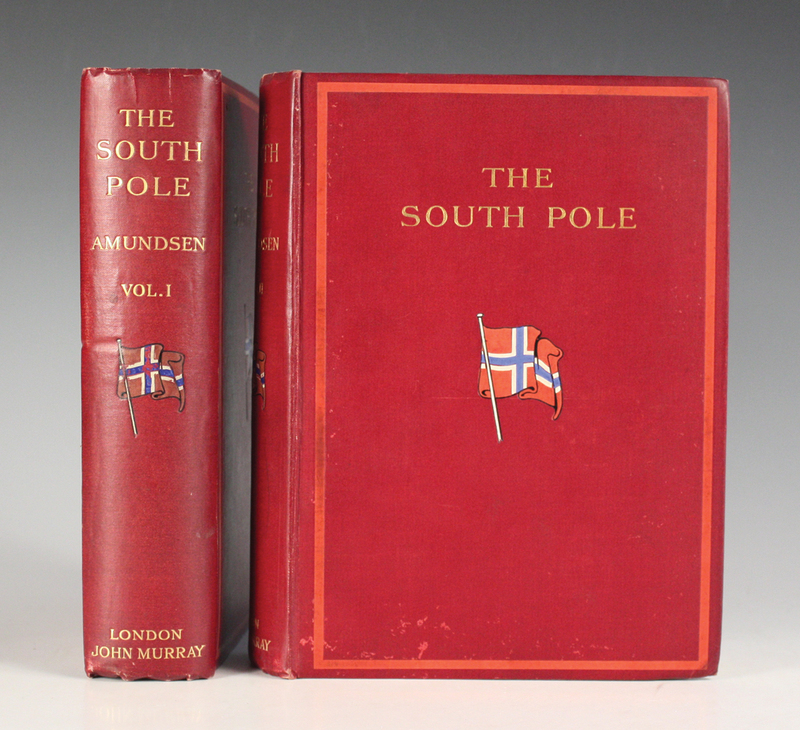 The sale commences with two works relating to the Arctic region, Lot 3001 and 3002 are both two volume sets presented in contemporary leather bindings. Lot 3001 is David Crantz’s ‘The History of Greenland’ being the first U.K. edition of 1767 estimated at £400-600, while Lot 3002 is Peter Cormack Sutherland’s ‘Journal of a Voyage in Baffin’s Bay’ published in 1852, estimated at £600-1000. Many of the works are first editions and provide first-hand accounts of travelling in the North and South. 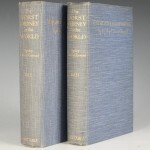 Lot 3027 is a 1922 printing of Apsley Cherry-Garrard’s ‘The Worst Journey in the World, Antarctic 1910-1913’. Taurus  described this work as ‘The best written and most enduring account of exploits in the Antarctic’ being the only first-hand account of Robert Falcon Scott’s ‘Terra Nova’ expedition. It is bound in the original blue cloth, a variant to that recorded in Spence , but which Rosove states is ‘significantly scarcer than the previous [cloth backed boards edition]‘. The two volumes carry a pre-sale estimate of £700-1000. 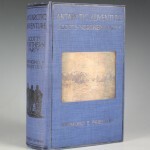 Another book relating to Scott is Lot 3026, Raymond E. Priestley’s ‘Antarctic Adventure, Scott’s Northern Party’. This first edition bound in the original decorated cloth is scarce, as ‘Many copies were destroyed during a fire at the publisher’s warehouse‘, see Spence . Lot 3024 is a first U.K. edition of Scott’s ‘The Voyage of the “Discovery”, printed in 1905. This two volume set includes a mounted clipped signature by Scott on the reverse of the frontispiece, reflected in the estimate of £1000-1500. 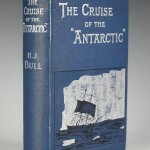 Further presentation copies can be found throughout the collection, Lot 3032 for example is Henrik Johan Bull’s ‘The Cruise of the “Antarctic” to the South Polar Regions’, which carries a presentation inscription from the author’s cousin, Johannes Catharinus Bull, aka ‘John’ to Miss Ivana Bull. John aided his cousin with the completion of the book and is acknowledged in the preface. This first edition is bound in the original decorated cloth and is offered with an estimate of £500-700. 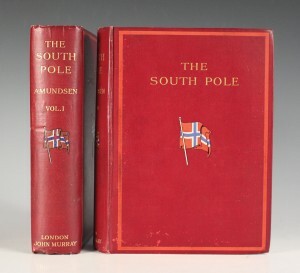 The sale also includes an account of the cornerstone of Antarctic exploration, Roald Amundsen’s ‘The South Pole, an Account of the Norwegian Antarctic Expedition in the “Fram”, 1910-1912’. Which describes the first expedition to reach the South Pole. 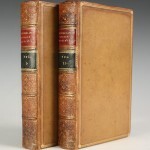 Although a second impression of the first English edition, this two volume set was printed a month after the first printing. It is bound in the original red cloth with Norwegian flags to the upper covers and spines. This work is Lot 3044 and is offered with an estimate of £400-600. These books relating to the Arctic and Antarctic are Lots 3001 to 3071 and are all illustrated on Toovey’s online catalogue. This Polar region collection joins other fascinating books within the auction, including Lot 3085 featured in our previous blog post. 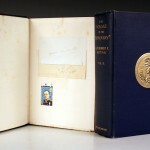 The Book Sale will be held on the 10th July 2012, commencing at 1.30pm, for viewing times and further information please visit www.tooveys.com. Lisa was born in Albuquerque, New Mexico. At the age of 4 she moved with her family to Italy, moving again to London when she was 10. She continued to live in London and eventually shared a one bed room flat with her husband and renting a separate studio. In 2007, Lisa and her partner decided to stop spending money to live uncomfortably and moved to Hastings, halving their outgoings and trebling their space. Lisa’s mother-in-law lived in the town so they both knew the area very well. Today she would not live anywhere else, as the move took them to somewhere that they now love. She acknowledges Hastings may have had a bad reputation, but personally cannot understand the reasons behind it. In her eyes the town is not too chichi like other neighbouring towns and is a wonderful place in itself, it also is host to a thriving artistic community. Does Sussex inspire her? Definitely, it may not be immediately translated in her work but she loves the contrasts between East and West Sussex and the nearby west Kent. From the Denge sound mirrors near Dungeness and the wilder parts of the pretty marshes in East Sussex to the ‘park-like’ appearance of West Sussex. Rye, Winchelsea and Hastings have their history, she says, but it is portrayed differently to the Cotswolds which has a Disney Land appearance. 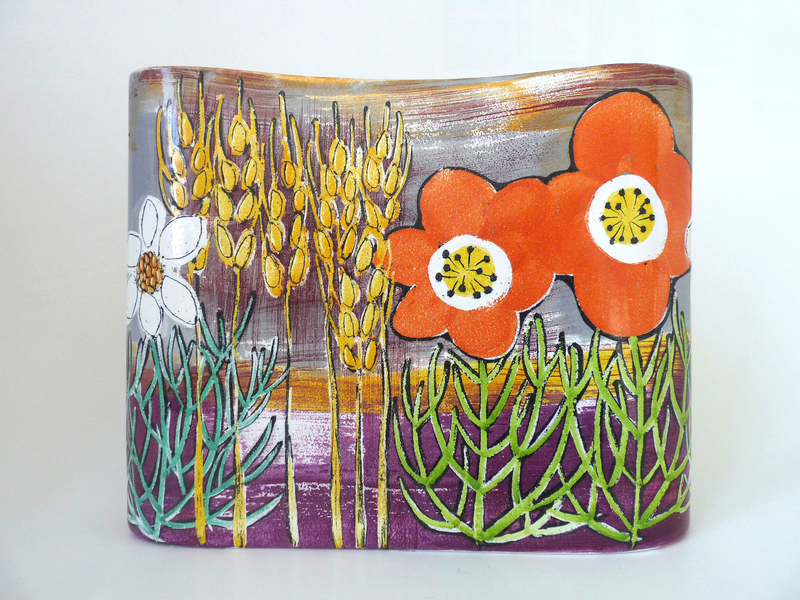 Whilst these places are more an inspiration, it is perhaps the proud scruffiness of nature and wild flowers in our counties that transfers onto her work in ceramics. 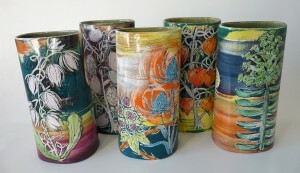 Lisa studied a BA in ceramics at Central School of Art, London, followed by an MA in ceramics at the Royal College of Art. 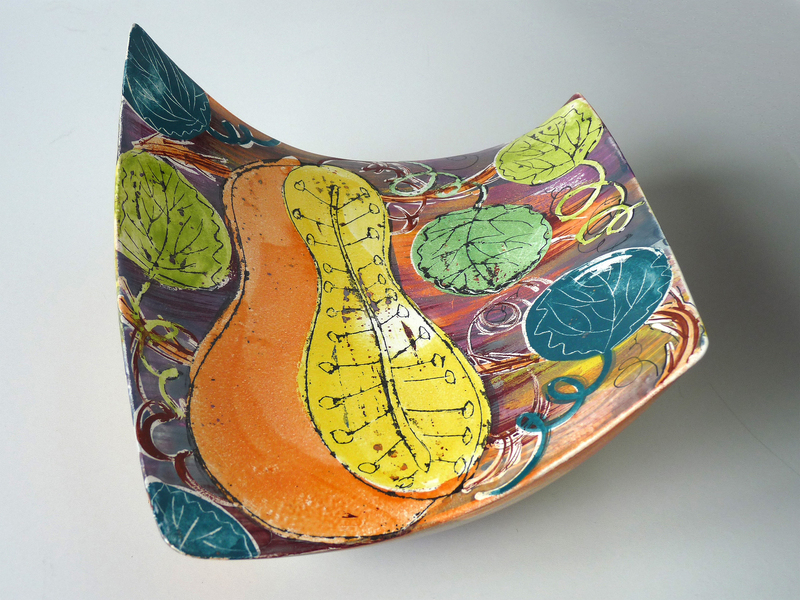 She is a professional member of the Craft Potters Association and on the Sussex Guild, she is also listed on the Craft Councils listed makers list. When she was leaving college very few of her fellow students could make a living from ceramics, with the public attitude being very much ‘Why pay that much for a vase?’. Fortunately today, people have a better understanding and appreciation for a one-off piece of art. As a nation our perception of ceramics as an art form is slowly changing, but a dedicated museum to ceramics, especially 20th Century works, still seems a long way off. 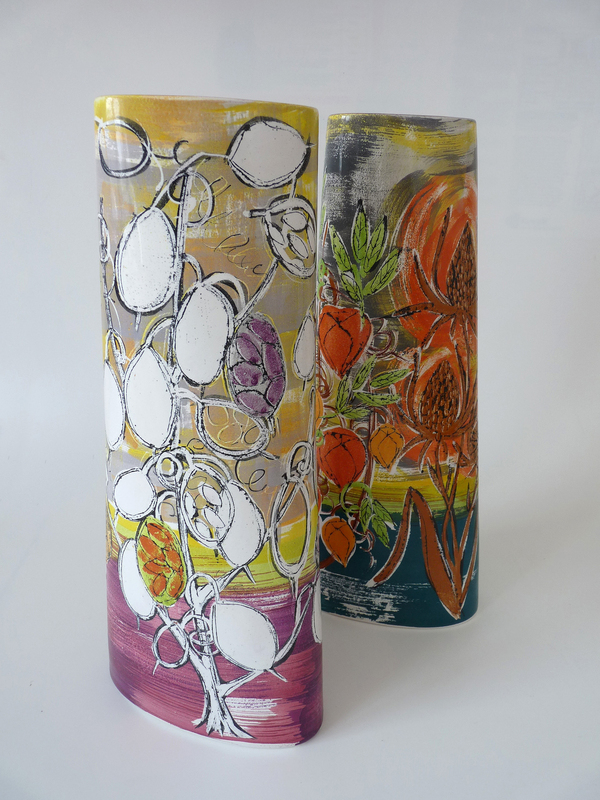 Lisa describes her work as traditional, her pieces are slip-cast or press moulded white earthenware adorned by hand-painted ‘tin-glaze’ decoration prior to firing. This technique was developed in Europe to imitate the imported and fashionable Chinese porcelain. It would be referred to as Majolica, Maiolica, Delft or Faience depending on where it was produced. She also says that her work is a half-half mix of design (as it is functional) and art (as it is individually painted). The traditional element also refers to the fact that not only is the work functional but she chooses flowers and nature as her subject. However her work is not stuck in the 18th or 19th Century, Lisa reinvents the oeuvre for a modern audience, the flowers are not painted in a botanical way, they are contextual. Her bright, colourful and cheery palette enables her work to be eye-catching and still fit within interiors of today. 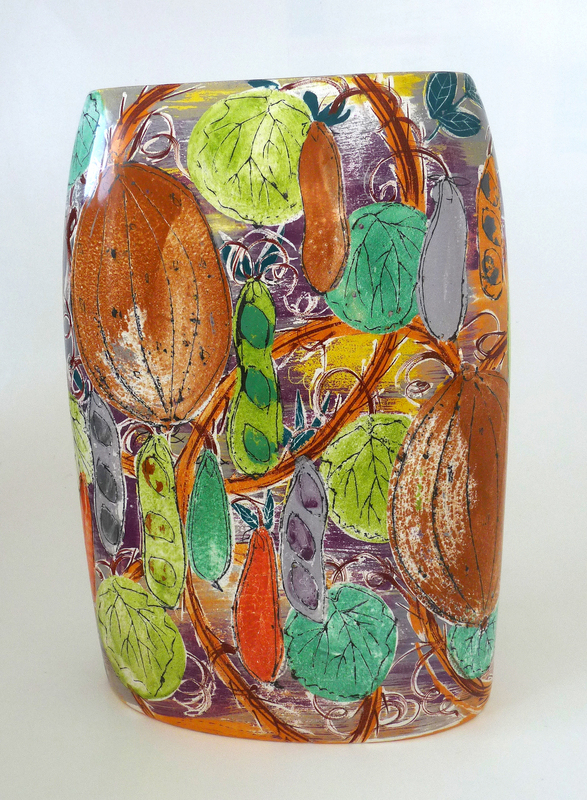 Her latest series of work concentrates around the renewed interest in ‘grow your own’, decorated with vegetables and fruit. 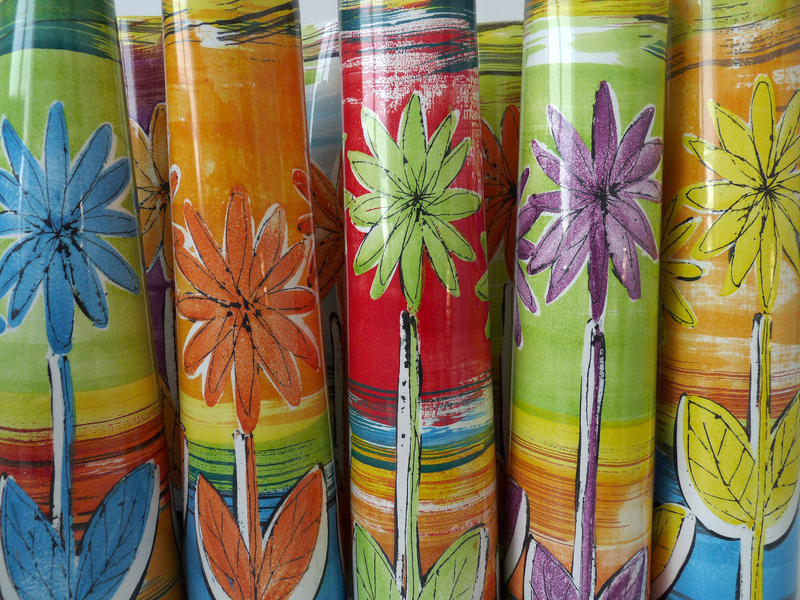 Lisa will be showing her work on the 9th and 10th June at the fabulous ‘Sussex Guild Show’ at Parham House near Storrington, and at ‘Art in Clay’ at Hatfield House in Hertfordshire on the 6th, 7th and 8th July. Her work can also be seen at Horsham Museum & Art Gallery between the 1st June and 7th July in a group exhibition with 49 other artists in the preview exhibition of Toovey’s Contemporary Art Auction where all the works on show will be offered for sale at their Spring Gardens Salerooms on the 21st July. Nicholas’ article was originally published in Sussex Life magazine in June 2012.